Home stake mine has been converted from working gold mine to a state of the art research facility trying to look for particles that are hard to detect on the surface. It also conducts research on new materials. This is one of the deepest man made structures, on and in the planet and constitutes a remarkable use space which could have been deserted. 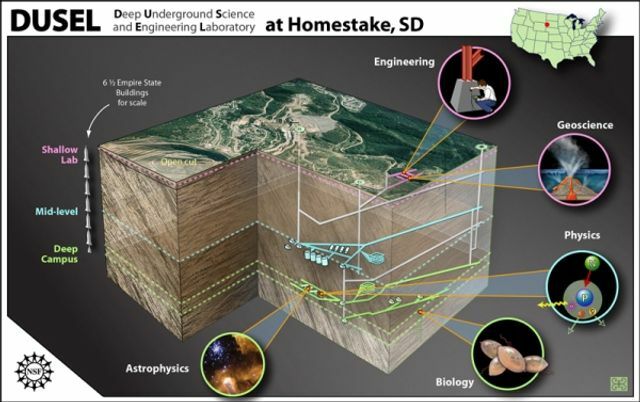 Almost a mile deep, under the Black Hills of South Dakota, the US government is building the world's deepest underground scientific hidey-hole. The groundbreaking for the facility was attended by politicians, connected individuals, and scientists who may eventually work in one of the labs to be built deep underground.The new labs will be built in and around the old Homestake Gold Mine, which extends as deeply as 8,000 feet underground. The gold mine was shut down in 2001 and allowed to flood when pumps were shut down. Refurbishing of the mine will involve restoring the pumps, refurbishing and stabilising tunnels, and building new underground infrastructure for scientific and other purposes.